It is difficult to treat as in 95% of cases there is no identifiable cause. Only 30% of people suffering from hypertension have it under control.3 Medication management is the most common form of therapy, but unfortunately, it is not entirely effective. Patients are often on more than one blood pressure medication, subjected to unwanted side effects, and have poor compliance. 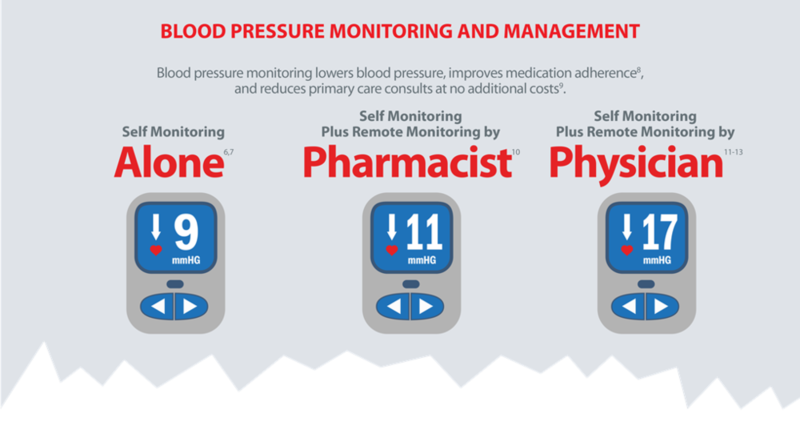 Because white coat and masked hypertension readings make diagnosis and treatment difficult, regular monitoring of blood pressure readings is needed to manage it properly. Cardiowell works by remotely monitoring and managing blood pressure and medications while empowering individuals to manage their stress and increase their wellness. Cardiowell’s ‘always connected’ blood pressure devices and weight scales automate data collection. Results are sent from the device over a secure cellular network making results immediately available to clinical pharmacists trained to make treatment recommendations. Cardiowell also collects additional indicators and predictors of cardiac health such as heart rate and heart rate variability.14 Cardiowell analyses minute fluctuations between each heart beat (heart rate variability) to quantify person’s wellness and provide greater insight into cardiac health. Heart rate variability (HRV) is considered one of the best single indicators of person’s health and an early indicator of sudden death.15 By measuring HRV over time, along with other vital signs such as blood pressure, Cardiowell helps to understand when a person is at increased risk. Breathing at six breaths per minute has been shown to increase heart rate variability and strengthen the body’s ability to regulate blood pressure.25, 53 It works by stimulating the parasympathetic nervous system and improves synchronization of the cardiac and respiratory systems. Evidence suggests that it is also very effective in alleviating depression,54-56 a major risk factor in heart disease. Normal respiration rate is about 12 breaths per minute (bpm), yet most people breathe at 18 bpm. Fast breathing is known to stimulate the sympathetic nervous system which over time can strain the cardiovascular system. Respiration rate, much like heart rate, is a marker for pulmonary dysfunction. Using mindfulness principles, Cardiowell increases a person's wellness by helping them breathe slower. Over time with increased awareness and better breathing, people's wellbeing increases and their blood pressure becomes more stable. The greatest predictor of a second heart attack or stroke is having uncontrolled blood pressure. Cardiowell can also be used by patient-centered homes allowing chronic disease patients and post-acute patients to be remotely cared for. Patients benefit from having to take fewer medications thus decreasing the number of side effects, while at the same time it helps payers reduce population risks and costs. Reducing blood pressure is the key to managing the exploding chronic disease crisis in the United States. 16. Linden, W. (1984). Psychological Perspectives of Essential Hypertension: Etiology, Maintenance, and Treatment (Vol. 3). Karger Medical and Scientific Publishers. 17. Shapiro, A. P. (1996). Hypertension and Stress: A Unified Concept. Psychology Press. 26. Reinke, A., Gevirtz, R., & Mussgay, L, (2007). Effects of Heart Rate Variability Feedback in Reducing Blood Pressure [Abstract]. Applied Psychophysiology and Biofeedback, 32, 134. 40. Parati G, Izzo JL Jr, Gavish B., Third Edition. JL Izzo and HR Black, Eds. (2003). Respiration and Blood Pressure. Hypertension Primer (Ch. A40, p117-120). Baltimore, Lippincott Williams & Wilkins.